You normally use pages for information that you want to share with your readers but don’t expect to update frequently. 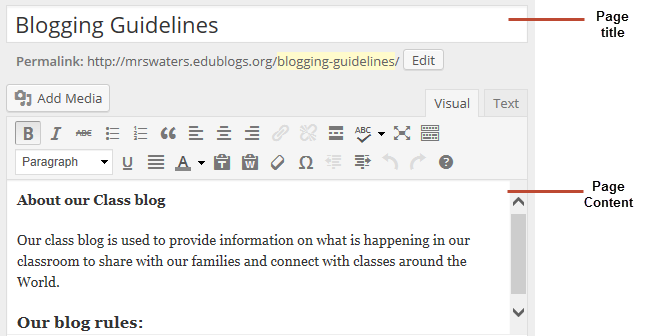 Some themes automatically add a link to pages in their header area at the top of the blog while on other themes you need to add a pages widget or set up a custom menu to add the page links to your main navigation area. An About page – for readers to find out more about you and your blog. Readers often use it to decide whether to bother subscribing to a blog. Your Page screen works very similar to your Post screen except that you don’t assign categories or tags to pages. Writing a page is similar to writing a post. The area where you write your page is by default in Visual Editing mode which uses WYSIWYG (What You See Is What You Get) option for formating. Simply write your page, highlight any text you want to format and then click the appropriate icon in the toolbar to add formatting such as bold, italics, number list. The visual editor displays a single row of icons when it is initially opened and you use the Toogle Toolbar icon to view the advanced formatting options contained in the second row. The advanced formatting options include heading styles, underlining, font color, custom characters, undo, redo. Before you publish your page it is a good idea to use the Preview option to see what it looks like to your readers. You preview a page by clicking on Save Draft and then Preview. This opens up a draft version of your page in a new tab. To make edits just go back to your Add New Page screen.